Color choice is a huge topic for concept art, illustration, and all types of entertainment art. Whether you’re working in oils or digital painting it’s crucial that you master color selection. Thankfully we have centuries of history and knowledge at our fingertips through books. Some of the world’s best artists have shared their thoughts on color and how to apply it accurately in art. In this post I’ve curated my top picks for color theory books so take a look and see what you think. Note: Visual learners may prefer this color theory video course on Pluralsight. It’s geared towards concept artists & illustrators with a focus on practical color matching. This course is part of a larger digital art video library and you can demo all of their courses with a free account. Color theory is generally a boring subject unless you apply it. That’s why Color Choices by Stephen Quiller is such a great book. This focuses on color senses and how to build your repertoire of colors in your work. Lights, shadows, and midtones all need to work together in a piece. Understanding which colors work together is a huge first step in the right direction. Over 144 pages Stephen explains why the color wheel is so important & how you can use this for all types of artwork. You’ll learn how to locate colors that work together and how to build a usable palette from scratch. The more you practice the better you’ll get so this is the type of book that keeps on giving. But it’s also a sweet intro guide for beginners who just cannot grasp the fundamentals of color in art. Here’s an old-school classic on color dating back quite a few decades. 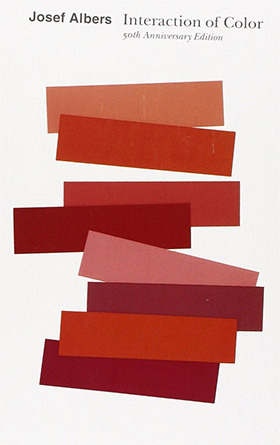 Interaction of Color by Josef Albers is a staple in most graphic design classrooms. But the lessons in this book also apply to artwork and painting. This book gets into a lot of varying topics that usually aren’t discussed when you’re first learning color. Topics like intensity, color boundaries, juxtapositions and casual gradation are all covered. It’s a book you can keep nearby and reference many times over, finding something new every time you read. The author explains his theories on how certain colors affect our perception based on other nearby colors. It’s a very complex topic but necessary for artists to understand. 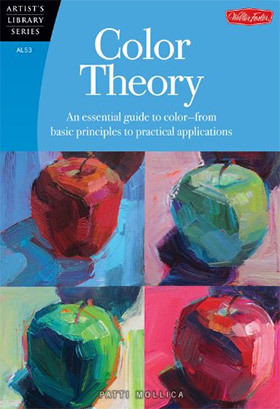 This book is not a simple intro to color theory but it’s a standard that many students have used for decades. This is a must-have for any artist trying to improve their color selection skills. 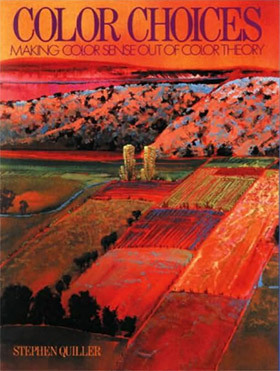 Color by Betty Edwards offers a mini-course in mixing colors. It’s 220+ pages long and it’s written by the same Betty Edwards who wrote the infamous title Drawing on the Right Side of the Brain. This book doesn’t have much rhetoric and it’s actually quite a handy reference for painters. You’ll learn how to mix pretty much anything using the color wheel and some common sense. Betty’s writing style is super easy to read and I find this book to fit perfectly for beginners. Granted this is not directly made for digital artists because most tips cover brushes, palettes, and more specific pointers for realistic work. But you can apply many of these color ideas into your paintings and follow other guides for mixing colors digitally. The best way to learn anything is through practice and Making Color Sing forces a whole lot of practice into your workflow. This book expands over 30 different exercises teaching you how to mix colors and why certain colors work better together than others. No individual color exists by itself. Every painting is a combination of colors and how they all work together. By working through this book you’ll learn how to see colors before they ever hit your canvas. You’ll develop your internal sense of which colors “feel” right together and how they’ll look when stacked up. If you struggle with clean compositions then you’ll learn a lot by working through this book. But I specifically recommend this more for intermediate-to-advanced artists who already have some experience working in color. 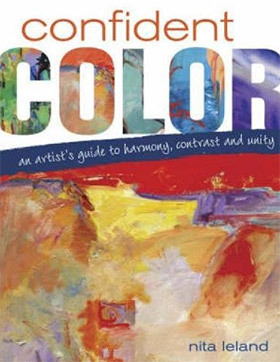 Artist and author Nita Leland shares her thoughts on color selection in this marvelous spiral-bound book Confident Color. She brings logic and intuition together so you can learn how certain colors interact while also feeling out which options would fit best into a painting. Through this approach you can eliminate the annoying guesswork of trying to match colors without any process. Throughout the book you’ll find artwork from 50 different artists showing off their use of color in real paintings. You’ll also find over 80 exercises for practicing what you learn and putting this color knowledge into action. Many artists even share their tips for combining colors with a few demos showing how to mix the perfect palette for your work. A brilliant book for the price and it offers so much for anyone willing to follow along. Most of art is about exploring and trying new things. Through this process you learn what works and what doesn’t, but you can speed up the process by following advice from other artists. 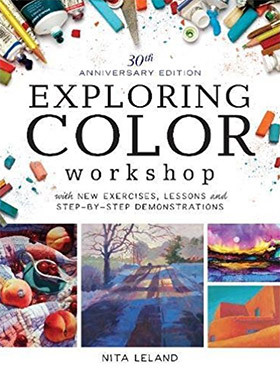 The book Exploring Color Workshop has been around for decades and just recently got an updated 30th anniversary edition. It takes color theory beyond any single medium showing you how color works in all types of art. This book comes with over 70 different exercises and 8 specific step-by-step demos that you can do at home. By putting in the time and following these exercises you’ll pick up what works for you and what doesn’t. There is no single best approach or best palette for painting. But if you understand the general guidelines of color choice you’ll know when and where to break the rules. 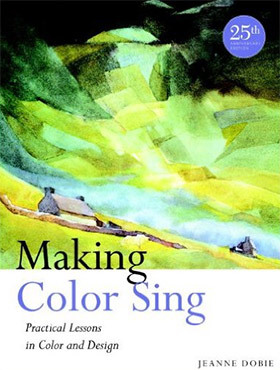 Patti Mollica’s book Color Theory offers a pretty extensive look into colors for painting. This title delves into the psychology of color along with color selection and mixing together a final piece. It’s a pretty simple read which makes it great for beginners, and it doesn’t hold you to any specific medium so these ideas work in digital painting too. There is a chapter on pigments with paint but this doesn’t make up a huge section of the book. Instead you’ll be learning more about mood, tone, temperatures, and how light & shadow color choices affect the entire composition. Knowing where to start and how to mix is only half the battle. Putting these ideas into practice is how you’ll really learn. It seems like there’s a mystery behind the colors we see and our seemingly-limited visible spectrum. 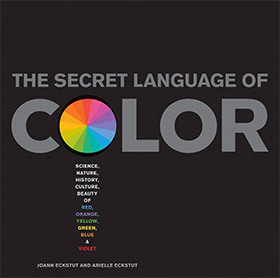 Secret Language of Color takes a deeper look into the world of color for art and how this plays such a huge role on our perception. This book reads more like a cosmic guide to color starting with the physics & science behind how color works. You’ll also find a lot of cultural anecdotes and psychological profiles for color interactions. By learning how color is created you’ll have a much stronger understanding to take into your paintings. Once you understand the symbiotic relationship of color and light, plus how colors mix to create new colors, you’ll start looking at painting from a whole new level. 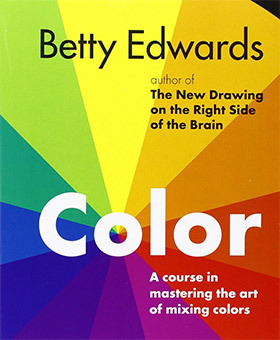 This is perhaps the only color theory book that can radically shift your perspective of reality and how you perceive color. It’s always worth challenging yourself with new ideas and this book is absolutely a challenge you should take on. 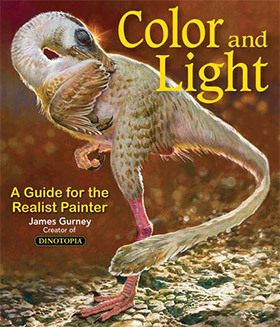 Gurney’s Color And Light is a staple for imaginative work. It comes with 220+ pages of advanced tips and techniques for painting things that don’t exist. Working with color is only one step of the process, but it’s a pretty big step that you have to get right. Gurney is a truly adept artist with a few books under his belt. Every one of them is worth owning but this one is especially valuable. This guide talks about lighting and form against imaginary creatures, objects, landscapes, and pretty much anything you want to make. It’s not strictly a guide on concept art but the lessons can easily apply to any imaginative work. That’s what makes this book so valuable and unique. Any type of entertainment artist from a concept artist to a visual development artist should own a copy of this masterpiece. 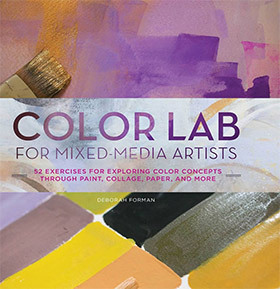 If you want to get a little more specific with your color then try Deborah Forman’s Color Lab for Mixed-Media Artists. This book looks into the world of mixed media and how it applies to painting. You’ll learn about color selection techniques but also how to work with colors for any mediums you choose. Each chapter covers a different color and you’ll find a handful of recipes for mixing brilliant color palettes from scratch. This really is more of a mixing guide than a painting guide so you do need experience to put this to good use. Traditional painters will find this invaluable for all mixed media work. There are dozens of awesome color schemes in this book and they’re all super easy to replicate by yourself. This practical guide to color is currently in its 2nd edition with new updated chapters on color mixing. 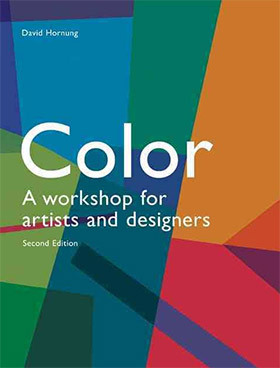 Color: A Workshop for Artists and Designers is a powerful 168-page color resource by David Hornung. Each chapter aims to bridge the gap between generic color theory and the practical application of color in art. You’ll find tons of examples in this book using many varying color schemes. Through these examples you’ll learn how to develop your eye for color selection and what makes a certain design stand out from the rest. David encourages a lot of color studies and even offers a bunch of exercises with each chapter. The very last chapter dives into color studies on the computer, a brilliant guide for all digital artists. Every book in this post is phenomenal and approaches color from a slightly different perspective. Whether you’re a practicing concept artist, illustrator, comic artist, or even a realist painter with a love for imagination, this list has something that’ll help improve your color selection prowess.